Also called Scots pancakes, Scotch pancakes, drop scones and Scottish pancakes. A similar recipe in Wales is known as pikeletts. 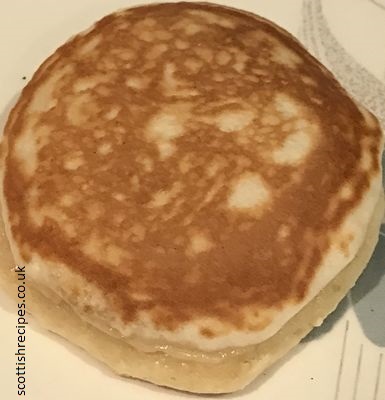 The drop scone recipe used by Maw Broon can be found in her new book Maw Broon's But An' Ben Cookbook . They are a favourite of her son Joe and he recommends soaking up egg yolks and the juice of fried tomatoes with them in a breakfast fry up. 1. Mix the flour, salt and sugar, add the egg and gradually beat in the milk to make a thick batter. 2. Add essence if used. 3. Bake 2 or 3 at a time by dropping spoonfuls of the mixture on a hot, well-greased griddle. 5. Turn and brown on the other side. 6. Serve hot or cold, with butter, jam, maple syrup etc. Our thanks to Catherine for this dropped scone recipe. 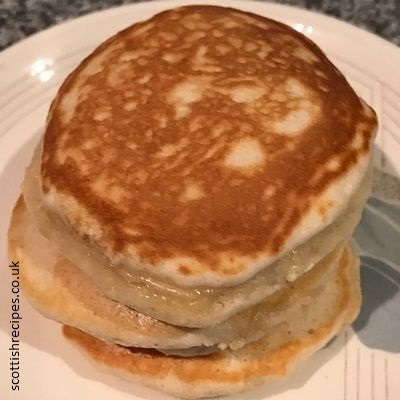 The book Scots Cooking: The Best Traditional and Contemporary Scottish Recipes by Sue Lawrence suggests making a batch of Scotch Pancakes and storing them in the freezer for a later date. Maw Broon's Cookbook has a Scottish drop scones recipe that uses the additional ingredient of a teaspoon of cream of tartar. Maw Broon suggests serving dropped scone recipes hot with butter and golden syrup. Other scone recipes in the baking section of Maw Broon's Cookbook include treacle scones, puff scones and sweet milk scones. Scots pancakes featured in a TV episode of The Woman Who Ate Scotland with food writer Nell Nelson on STV on Thursday 5 July 2007 at 7:30pm. She attended the Ballater Scottish Women's Rural Institute (SWRI) in Aberdeenshire where she took the General Housewives aptitude test in baking. 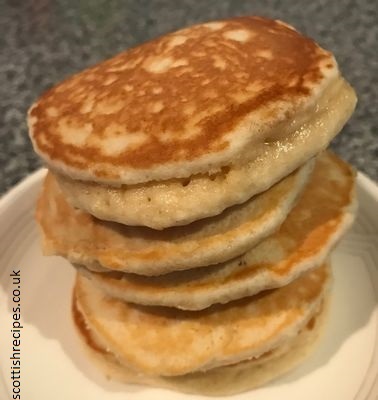 Nell Nelson had to cook Scottish pancakes using her Edinburgh born mum's recipe. Four members of the SWRI judged her Scots pancakes which were described as perfect. The judges assessed Nell during filming of The Woman Who Ate Scotland in Royal Deeside on her approach, preparation and flavour. They gave television viewers tips such as heating the metal spoon with boiling water, pre heating the griddle and wrapping the cooked Scotch pancakes in a clean warmed towel to keep the pancakes hot. The results of Nell's General Housewives aptitude test in baking was good colouring, soft texture and a good soft taste. Though Nell Nelson lost points for a messy method of work, too thick a Scots pancake mixture and layout and appearance. The women of the SWRI agreed that she should have placed two pancakes on paper plates with doilies. During the screening of the television programme The Woman Who Ate Scotland Nell Nelson cycles to the next location and viewers were treated to scenes of Royal Deeside before she made her way to Aberdeen City. She then popped into Aberdeen Fish Market at Aberdeen harbour to buy lemon sole fish at the fish auction and was taught how to look for fresh fish by Ed Fletcher an Aberdonian fish merchant. She then took this to the Silver Darling restaurant where she was taught how to fillet fresh fish and then cook lemon sole. The show continued with her cycling round Footdee and scenes of Carmelite Hotel where she stayed overnight before boarding a ferry to the Shetland Islands. On board the ferry she was taught how they cook each meal fresh as an order is taken from the ferry restaurant by chef Derek Walker. After sampling the poached fish dish with new potatoes she relaxed with a Shetland gin and tonic. A Scottish pancake would have rounded off the meal!